HOW DO YOU MEASURE FUN? We've pondered many times what kind of measurement we should use to evaluate fun. Now, you can hardly use a measuring tape since, you know, fun isn't technically tangible in the strictest sense. It's wracked our brains for decades. But, then our friend Froggy made us realize that the only way to really evaluate something as ethereal as fun is to bottle up what helps to create it! Well, with all of Froggy's magic bubbles, it became clear. "Fun" can be bottled up by the gallon! Now that we've got that solved, you can bring home a gallon of fun with just a few quick clicks! 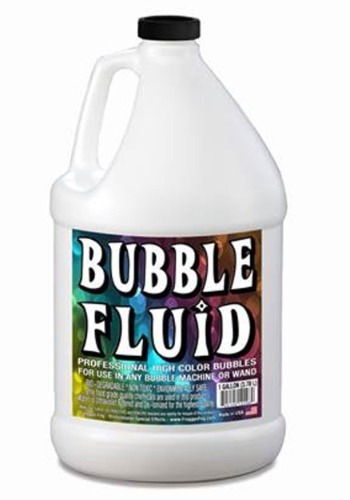 This gallon of Froggy's Bubble Juice is "Fun" in liquid form and sure to last you as long as you like. Use the bubble juice with a wand to create enough individual bubbles to last you a lifetime or fill a Froggy's Bubble Machine to create thousands and thousands of bouncing bubbles in moments! THE ANSWER IS MORE BUBBLES! If you've ever felt that maybe you're missing a little bit of fun in your life, like many do on occasion, we've got the solid solution. Well, semi-solid, anyway. You need more fun bubbles in your life, of course, and this Bubble Juice is just the ticket to make it happen.